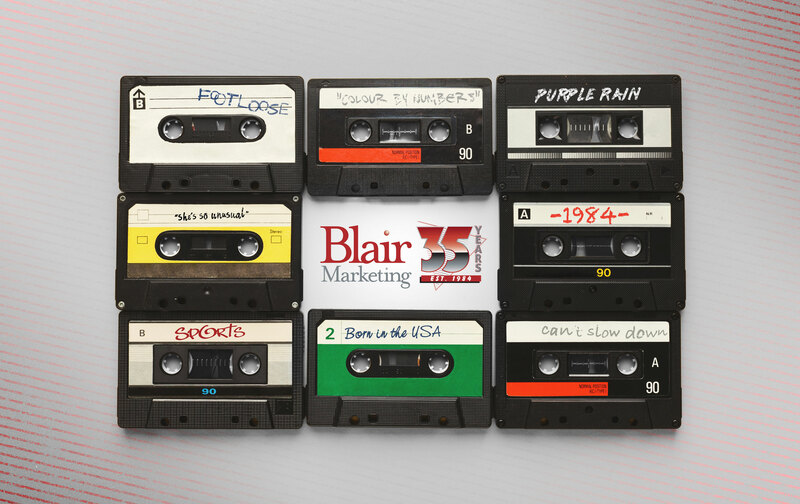 Amazingly, this year marks Blair Marketing’s 35th year of service. We’re commemorating this achievement with an anniversary logo that hearkens back to that glamorous, techno-pop era of our founding…when hair was big, ties were wide, and the most stylish shoulders were padded. In 1984, Bob Blair and his wife, Sandy, started Blair Communications in his home. He was soon joined by Billy McBratney, and from second-floor offices on Church Street—in a building that a generation before had housed Lynchburg’s first TV station—our company began an adventure that continues to this day. Something else happened in 1984, too. A radical company named Apple introduced the Macintosh: the first commercial PC with a mouse and built-in monitor. It was a development that would re-shape our company and our industry. By 1991, we had become one of the first agencies in the region to incorporate Apple computers in our day-to-day production…and Josh Quintero had arrived to help us figure out this game-changing technology. Since then we’ve worked to keep pace with the constant evolution of tools and tactics in marketing communications. In 2012, Kip Smith bought the company from Bob Blair, building upon his decades of experience with the firm. There is, of course, one constant throughout all these decades of change: our clients. Getting to know them, their products &amp; services, their markets…and helping them convey the right message to the right audiences at the right time. Those relationships are what continue to drive us day by day. We’re truly grateful for our clients and our vendor partners—and especially all of the many talented team members that we’ve employed throughout the years—who’ve enabled us to reach this anniversary. We love it when clients get kudos.